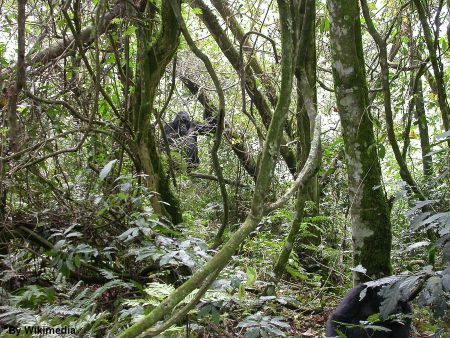 Gorilla tracking is often described as a “life changing” experience and with good reason. With only an estimated 900 Gorillas left in the world, to see these gentle creatures in their natural habitat is a truly unique moment. Look into a silverback’s eyes and he will return the gaze with a thinking, intelligent gaze. Meeting such close “relatives” is a magical encounter that transcends any other wild life encounter. 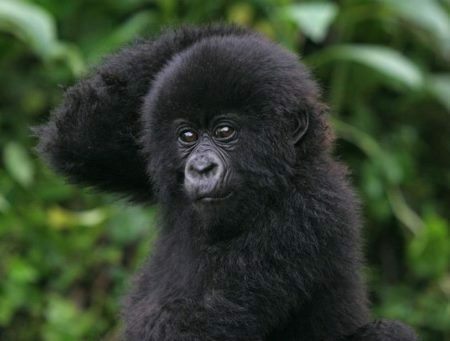 Gorillas are found in Uganda, Rwanda and Congo of which we offer Uganda and Rwanda. – Ease of getting to the gorillas: Uganda sells permits for a particular gorilla group which you can request when booking well in advance. Although keep in mind that the location of your accommodation influences which groups you can see as the driving distance is 2-5 hours between starting points. In Rwanda which group you will see is decided upon on the day by the guides as all groups start out from the same starting point. This allows for assignment of less athletic and older people to gorilla groups that are closer to the starting point. Hence, less fit people might consider this advantage. Also people that like to take longer hikes can state their preference. In Uganda your permit is for a particular group and that’s where you will go, regardless of their location that day. But remember, this is a “wild” experience and one can never predict where wild life will be exactly. – Cost: Permit trekking prices are US$1,500 for Rwanda and US$600 for Uganda. Uganda visa (also valid for Kenya and Rwanda) for Americans is US$100, Rwanda visa is US$30. Please inquire for Rwanda and Uganda journeys as well as longer Rwanda journeys that include different areas of the country. 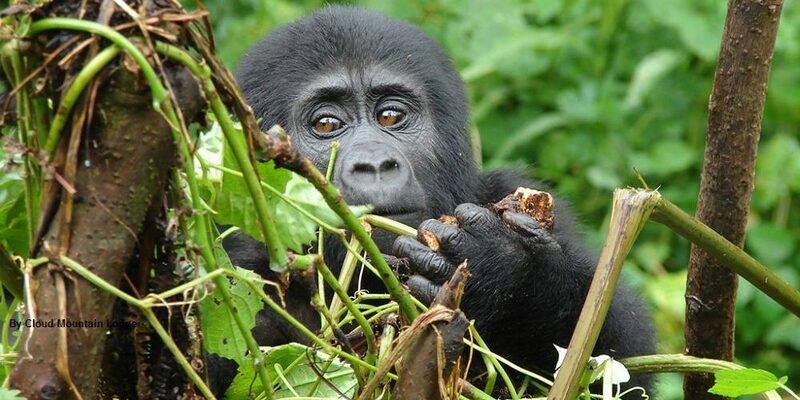 Ugandas gorilla trekking happens in one of East Africa’s most famous national parks, the World Heritage listed Bwindi Impenetrable National Park. There is nothing in comparison to the thrill to observing these magnificent, peacefull apes in their native environment. But they aren’t the country’s only great apes. 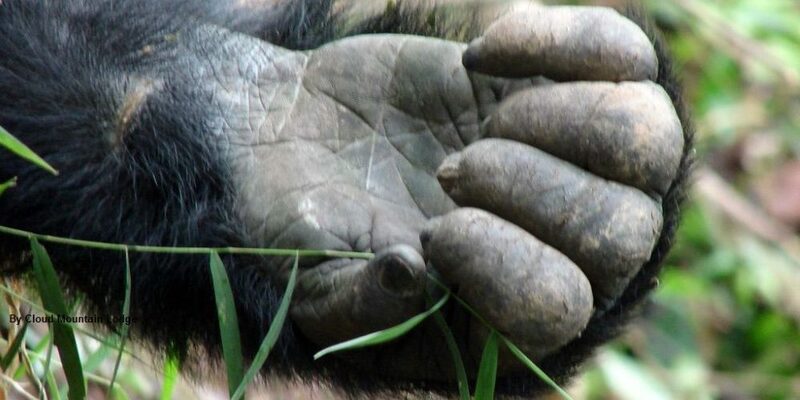 Humankind’s closest relative, the chimpanzee, is found in several of areas of Uganda. Please inquire with us if you are interested in our Uganda/Rwanda journey. Explore Northern Tanzania, including the Serengeti, Ngorongoro Crater, Tarangire and Lake Manyara National Park. Stay at authentic safari camps as well as hotels. Meet Maasai in their village and visit a local school project. Continue on the Uganda for gorilla tracking in Bwindi Impenetrable National Forest. Fly into Bwindi Impenetrable National Forest to track the magnificent gorillas and take a community walk. Choose from additional cultural outings to your liking. Jan, Feb, June to Oct and December. Although it is possible to go year round, April, May and November are wetter and gorilla trekking is more slippery. After an early rise you will have a hearty breakfast to give you enough energy for the gorilla tracking. Your driver will take you to park head quarters for a briefing explaining gorilla viewing etiquette such as to never make eye contact with a silverback. Scouts locate the groups early in the morning and advise the warden of their locations. 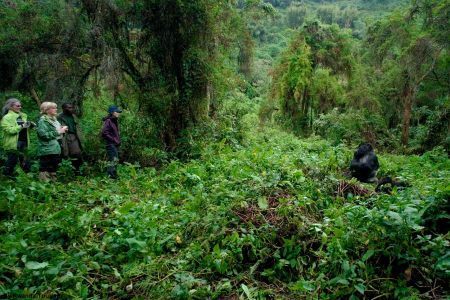 The guides will then take you through the bush pushing your way through the undergrowth, parting thick creepers, to track the gorillas. Each visitor group is usually led by a park ranger/guide, two trackers and two armed guards. Porters are available for extra charge to carry your personal items such as lunch, drinks and cameras. We highly encourage you to hire a porter, not only to make the trek less strenuous and having help up steep hills but also to support the locals with extra income. 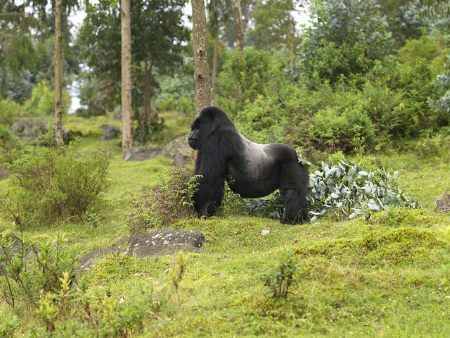 It can take anywhere from ½ an hour to 7 hours to reach the gorilla group – a reasonable degree of fitness is required as well as a sturdy pair of hiking boots. Once a gorilla group has been spotted by the guide, he will keep them calm by making low grunting sounds and imitating their picking and chewing leaves. You will then be led closer to the group. It is an extraordinary feeling sitting in the dense rainforest knowing you are with a few of the last remaining mountain gorillas. A mature silverback male gorilla may weigh as much as 440 pounds, or about 3 times the overall weight of an average man. 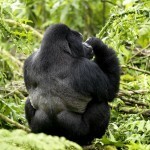 The males are referred to as the silverback because as they mature the hair on their back turns somewhat silver. However, any anxiety normally disappears once you set eyes on the group. Normally the gorilla group will be scattered over a small area of thick vegetation. They will carry on with their interactions and even feed without any concern of their human visitors although they will be observing you with interest. On occasion, a playful youngster will boldly approach you with inquisitiveness, at times coming really close that you will need to move aside. (You are not allowed to move less than 7 meters close to them but they might come closer to you; this is to safe guard the gorillas from contagious human diseases.) Sadly enough there are only about 850 of these beautiful creatures left in the world. You are allowed exactly one hour with the gorillas before returning to the base station. We must also stress that, while you have a very good chance of seeing gorillas, success is not guaranteed (although chances are around 96%!). They are wild creatures with no fixed routine and finding them requires the skills and experience of your trackers and guides. The trackers and guides have helped to habituate the gorilla groups and know them intimately, so the chances of locating them are excellent. A fascinating fact is that gorillas share 98% of their genetic composition with humans. High season is June – September and December to February. It’s hard to predict nowadays when the rainy season will be. Climate changes are making it difficult to forecast. Normally the long rainy season should be in March, April and beginning of May and short rainy season in November. However, the last 5 years the short rainy season has been in early December. Gorilla tracking can be done throughout the year and success rate of seeing them is the same . In rainy season the tracks in the rain forest might be a bit muddier and your tracking might be a bit longer and tougher because of that. However, it’s a rain forest, so the difference is not all that big compared to dry season, especially in November. In rainy season you are more likely to track in smaller groups. 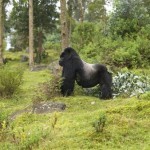 Within Uganda, Gorilla trekking is conducted in Bwindi National Park or in Mgahinga National Park. 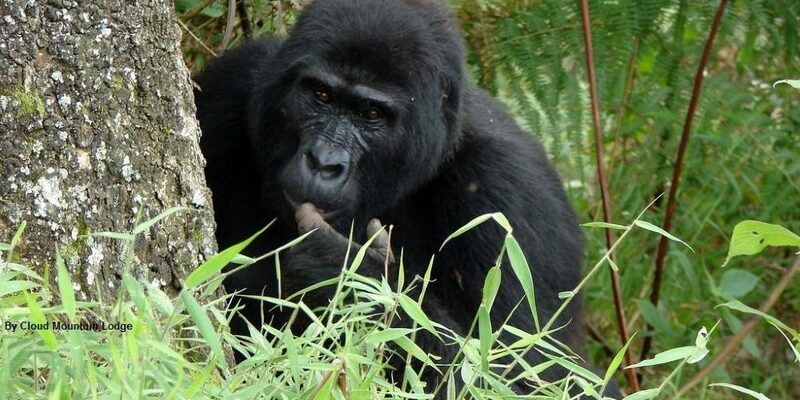 But because of the inconsistency of gorillas in Mgahinga, the majority of the sold permits are for Bwindi NP. In Uganda, every gorilla permit goes for US$600. On a single day, nearly 72 people travel into Bwindi to see gorillas and only 8 people are allowed per gorilla family. Permits are sold first come, first served by the park service. If you are planning to visit in high season of June to September or December to February we encourage advance notice to secure your preferred date. In Uganda you may state your preference which group you would like to visit but consideration also has to be given to the location of your accommodation. Bwindi Impenetrable Forest is one of Africa’s most ancient habitat. With an altitude span of 3,800’ to 8,550’ this antiquity has produced an incredible diversity of flora and fauna, even by normal rainforest standards. And we do mean rainforest; up to 8.2 feet of rain falls here annually. With over 205 square miles of steep mountainous rainforest, the park is home to an estimated 360 endangered mountain gorillas which is undoubtedly Uganda’s biggest tourist attraction. It contains 120 species of mammals, though sightings are less common due to the dense forest. Lucky visitors might see forest elephants, 11 species of primate (including chimpanzees and L’Hoest’s monkeys), duiker, bushbuck, African golden cats and the rare giant forest hog, as well as a host of bird and insect species. For birdwatchers it’s one of the most exciting destinations in the country with close to 360 species. With a good guide, sightings can be of over 150 species. The word “Bwindi” means “darkness” and hiking here will show why the forest was named so. You will as well be in position to tell why actually the forest is also regarded as Impenetrable. 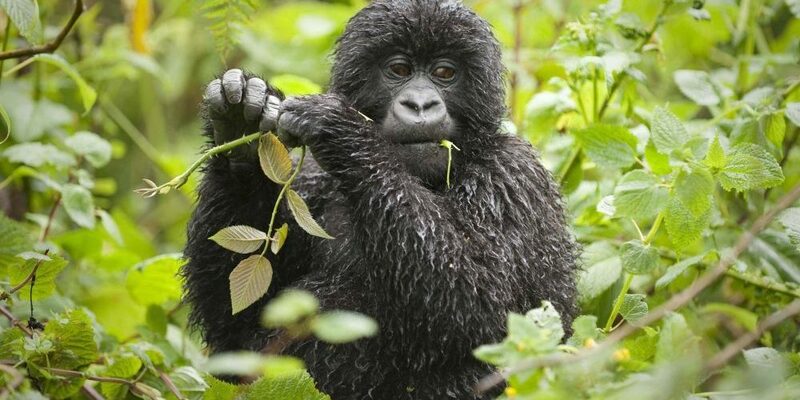 One requires to be realistically physically fit to take part in this mountain gorilla tracking / trekking adventure because it may involve climbing the steep terrain. Northers Sector Buhoma Area– Rushegura Group with 21 members, Mubare Group with 5 members, Habinyanja Group with 17 members. Northern Sector Ruhija Area – Bitukura Group with about 13 members, Oruzogo Group with about 23 members. Southern Sector near Kisoro Town –Mishaya Group with 7 members, Nkuringo Group with 17 members, Nshongi Group with 7 members, Kahungye with about 24 members. In Uganda you can find four different areas from which to begin the gorilla tracking. They are each between 2 and 5 hours driving from the other. 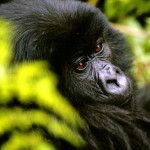 Therefore, your choice of accommodation also influences the options of the gorilla group you can visit. On the south western boundary of Bwindi you find Central Africa’s most ancient ethnic group: a community of Batwa Pygmies that left the forest and were relocated into an area of 13 hectares, where today they are learning sustainable lifestyles. The Batwa are a fascinating group to interact with. Their wealth of knowledge about nature and their primitive hunter-gather ways is captivating and educating. 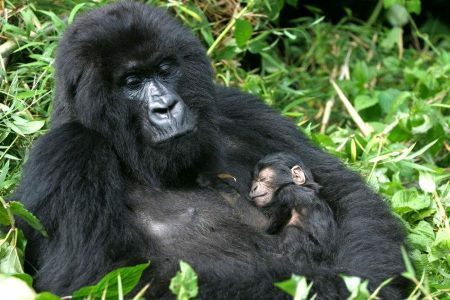 Rwanda’s tourism is best known for it’s gorilla trekking in Volcanoes National Park. It’s hard to find the words to describe the sensation of looking into the eyes of a wild mountain gorilla standing so close you could touch it (but of course you won’t to avoid transmitting diseases). It’s a “bucket-list” experience not to be missed and Rwanda is a good place for doing it. Another fantastic primate-viewing area as well as a birders hotspot is Nyungwe Forst National Park. Best timefor gorilla trekking in Rwanda is during the dry season July-September and December to February..
After an early rise you will have a hearty breakfast to give you enough energy for the gorilla tracking. Your driver will take you to park head quarters in Kiningi for a briefing explaining gorilla viewing etiquette such as to never make eye contact with a silverback. Armed guards are with the groups 24 hours and advise the warden of their locations. The guides will then take you through the bush pushing your way through the undergrowth, parting thick creepers, to track the gorillas. Each visitor group is usually led by a park ranger/guide, two trackers and two armed personel. Porters are available for extra charge to carry your personal items such as lunch, drinks and cameras. 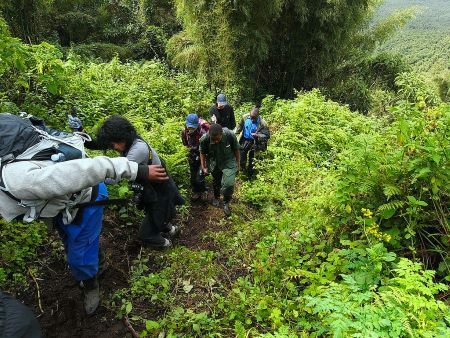 We highly recommend the services of a porter, not only to help with the steep and muddy stretches, but also to support the local community with extra income. Once a gorilla group has been spotted by the guide he will calm them by making low grunting sounds and imitating their picking and chewing leaves. You will then be led closer to the group. It is an extraordinary feeling sitting in the dense rainforest knowing you are with a few of the last remaining mountain gorillas. A mature silverback male gorilla may weigh as much as 440 pounds, or 3 times the overall weight of an average man. The males are referred to as the silverback because as they mature the hair on their back turns somewhat silver, hence the name Silverbacks. However the anxiety of being close to these majestic apes normally disappears once you set eyes on the group. Normally the gorilla group will be scattered over a small area of thick vegetation. They will carry on with their interactions and even feed without any concern of their human visitors although they will be observing you with interest. Sometimes a playful youngster will boldly approach you with inquisitiveness, at times coming really close that you will need to move away. You are not allowed to move less than 7 meters close to them; this is to safe guard the gorillas from contagious human diseases. You are allowed exactly one hour with the gorillas before returning to the base station. We must also stress that, while you have a very good chance of seeing gorillas, success is not guaranteed (although chances are around 96%! A fascinating fact is that Gorillas and humans share 98% of their genetic composition. Any visitors who show signs of communicable illness will not be permitted to trek and will be refunded 50% of the permit cost. 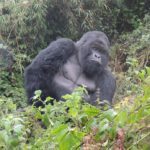 It is highly unusual to not see gorillas on your trek, but if you are in the unlucky 2% that don’t, you are also entitled to 50% of your permit fee refunded. The minimum age for visiting gorillas is 15 years old. As of 2015, there are 10 mountain gorilla groups habituated making it 80 gorilla permits for visitors to Rwanda available every single day. 8 people per group can trek to these endangered apes. With a gorilla permit costing US $ 750 per person per trek, part of your contribution goes to conserving these mountain gorillas. Armed guards follow the groups 24 hours a day! The decision of which group you may visit is made on the morning of your trek by the wardens. Consideration is given to fitness levels and desires of length of trek may be considered. Permits should be booked well in advance, especially during Rwanda’s high season of June – September and December to February. Rwanda does not provide discounts during the rainy season. Part of the cost goes to conservation and protection of the gorillas by 24 hour armed guards. Shoes –We recommend hiking boots for foot wear, since you need to cover above the ankle. You might be hiking through deep mud. You can also ask for knee-high rubber wellies but they are difficult to walk in on longer distances. Hiking boots are good for the steep terrain sometimes full of vines depending on the gorilla family which you are visiting. Even the gorilla rangers in Uganda and Rwanda will be wearing rubber boots, locally called gum boots. Gaiters are highly recommended.